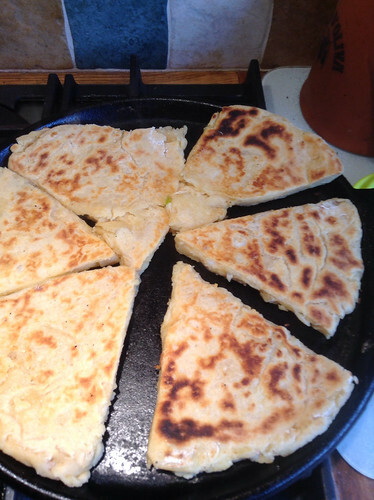 Potato scones are a doddle. 3-2-1 potato, flour, butter or marg. I usually do 150g of spud, but there was 225g leftover from last night and really, what am I going to do with 3oz of mash? To hell with it, it’s Friday, I used it all. So – rub flour and marg/butter together to make breadcrumbs. Squish in the mashed potato* to make a dough. You’ll need some milk at this point – somewhere between a dribble and a splash, I guess – just to make the dough more pliable. If you make it too sloppy, don’t worry – just add more flour! Roll it out into (an approximation) of a circle – the thickness doesn’t matter, really, it only affects the cooking time – and divide into six. You can bake these in a hot oven for 10-12 minutes, but I tend to do them on the gas hob on a cast iron griddle (any heavy bottomed frying pan would do). It uses less energy. Turn them after 5 minutes or so, or when they’re browning and cook the other side. I actually had time to wash up and wipe down the worktops while they were cooking. Traditionally, these are served with bacon in Ireland, but we just scoff them as is, with lashings^H^H a tiny bit of butter. *If I have cold potato, unmashed, I tend to bung it all in the food processor, but I did it by hand today.